The Difference, Power, and Discrimination program and its partners host several workshops and lectures of varying length on a variety of DPD topics throughout each academic year. 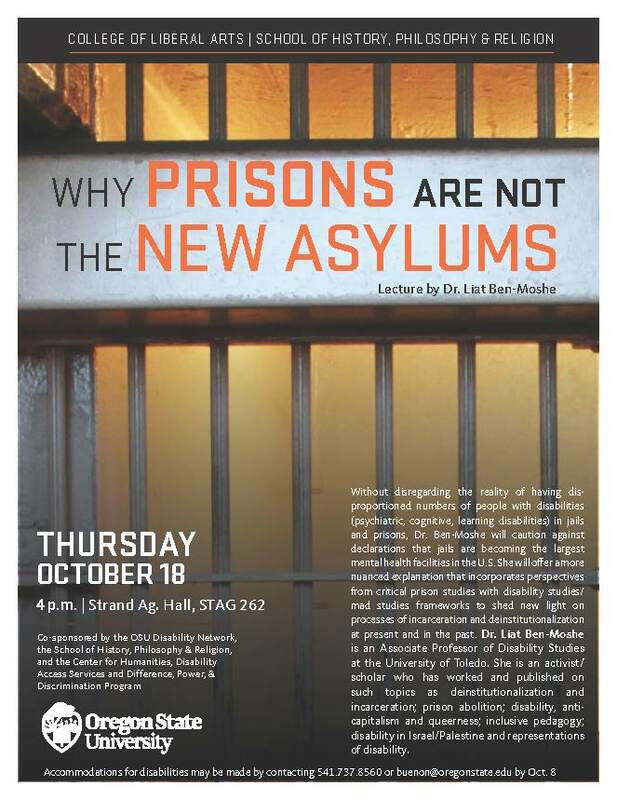 Without disregarding the reality of having disproportioned numbers of people with disabilities (psychiatric, cognitive, learning disabilities) in jails and prisons, Dr. Ben-Moshe will caution against declarations that jails are becoming the largest mental health facilities in the U.S. She will offer a more nuanced explanation that incorporates perspectives from critical prison studies with disability studies/mad studies frameworks to shed new light on processes of incarceration and deinstitutionalization at present and in the past. 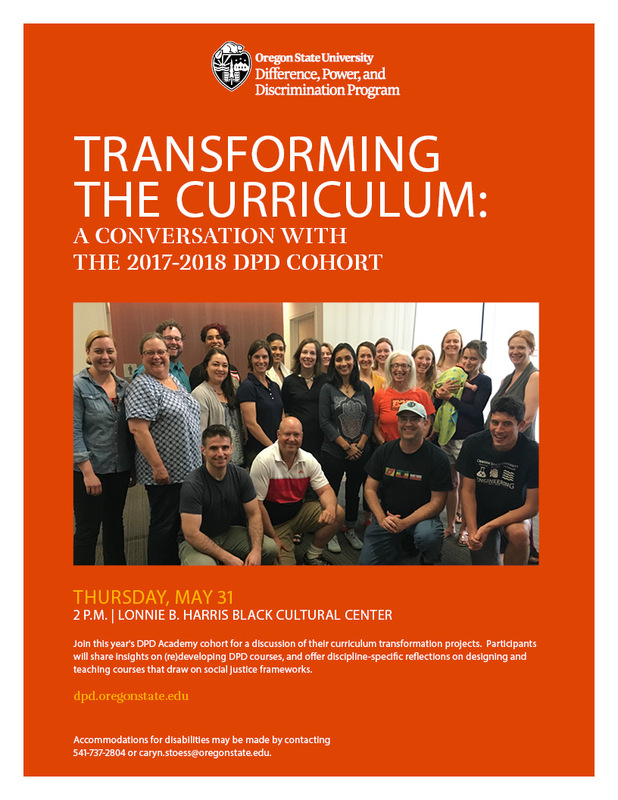 Join this year’s DPD Academy cohort for a discussion of their curriculum transformation projects. 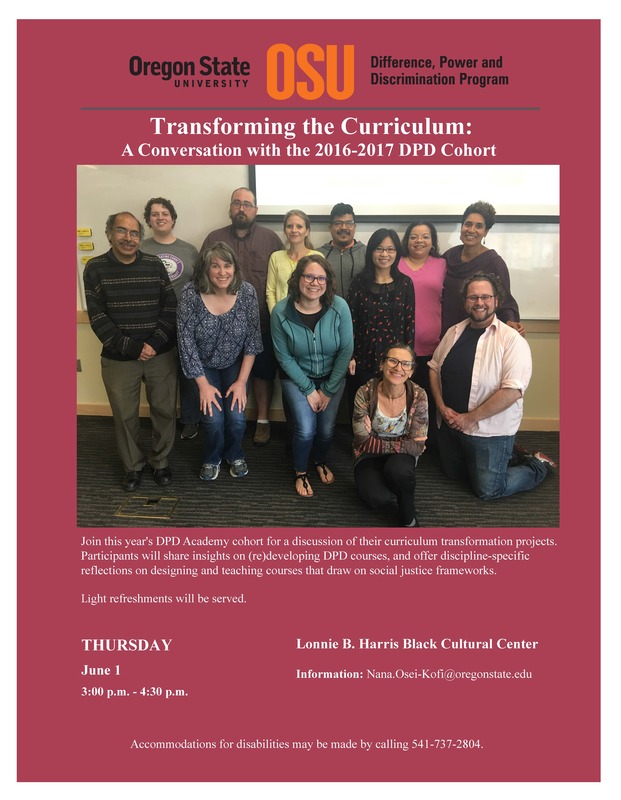 Participants will share insights on (re)developing DPD courses, and offer discipline-specific reflections on designing and teaching courses that draw on social justice frameworks. Free & open to the public. All films will be captioned. 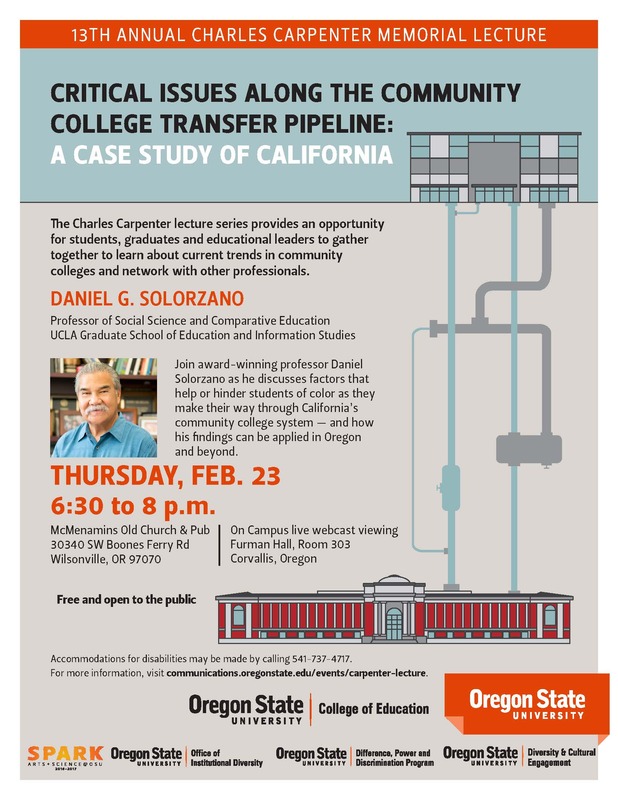 Join award-winning professor Daniel Solorzano as he discusses factors that help or hinder students of color as they make their way through California’s community college system — and how his findings can be applied in Oregon and beyond. Public pedagogy and the notion that cultural studies education takes place both within and far beyond the classroom are central concepts that inform the TeachOUT project that Julia and Tina have been leading at the University of Oregon since 2010. 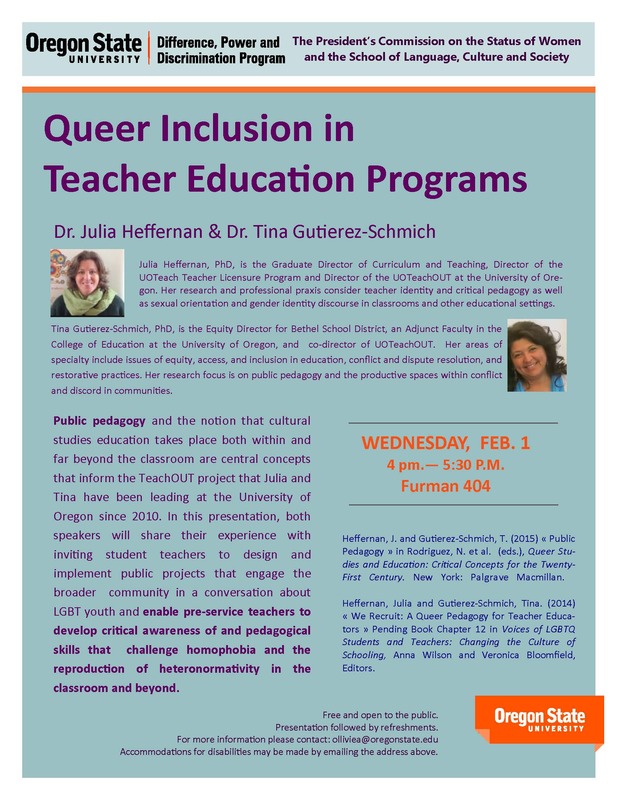 In this presentation, both speakers will share their experience with inviting student teachers to design and implement public projects that engage the broader community in a conversation about LGBT youth and enable pre-service teachers to develop critical awareness of and pedagogical skills that challenge homophobia and the reproduction of heteronormativity in the classroom and beyond. How can teacher educators adopt policies and practices to promote LGBTQ advocacy in teacher education? 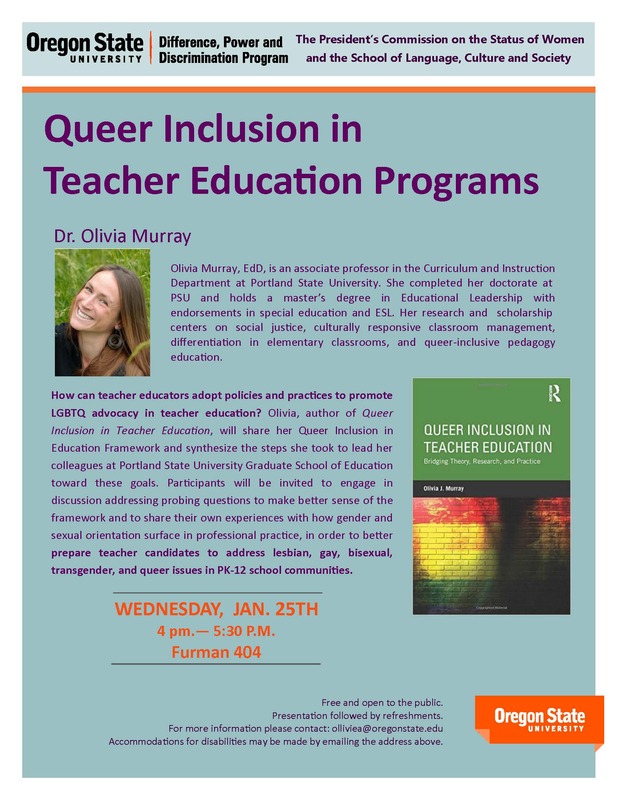 Olivia, author of Queer Inclusion in Teacher Education, will share her Queer Inclusion in Education Framework and synthesize the steps she took to lead her colleagues at Portland State University Graduate School of Education toward these goals. What is the rhetoric of the new racism in our "post-racial" era? How can racism be both clearly invoked within a presidential debate, and yet denied as a topic, as a force shaping everyday life? 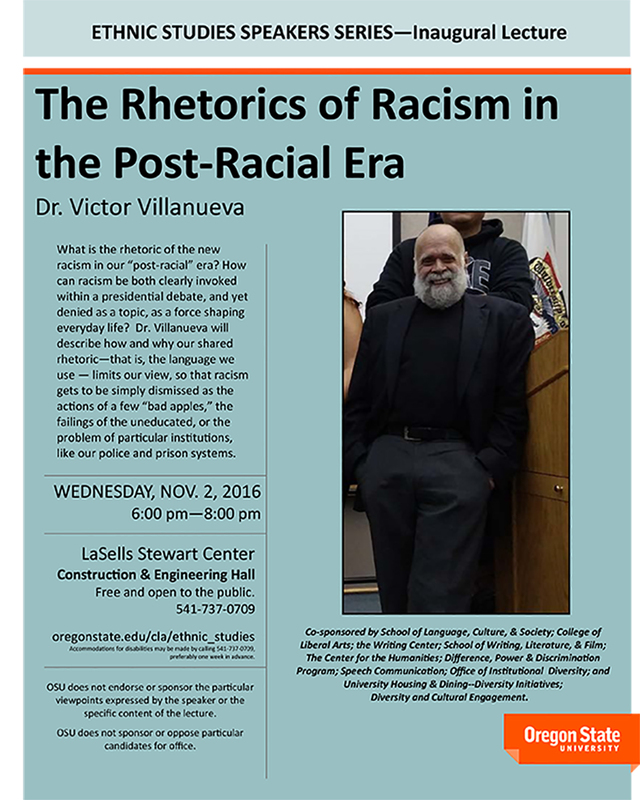 Dr. Villanueva will describe how and why our shared rhetoric -- that is, the language we use -- limits our view, so that racism gets to be simply dismissed as the actions of a few "bad apples," the failings of the uneducated, or the problem of particular institutions, like our police and prison systems. Bring your lunch and join us for an informal conversation with Alison Gash on the topic of "After the Honeymoon: Gay Rights in a post-Obama World." No RSVP is required. It is undeniable. The growth of LGBTQ rights during Obama's two-term presidency is unprecedented. What accounts for this growth? Advocate strategies clearly played a role. Court directives paved the way for significant gains. Public opinion, too, shifted rapidly. Less salient, however, is the role of the Obama administration in both creating opportunities for LGBTQ advancement and combatting restrictions emanating from anti-LGBTQ bias. In this talk Alison Gash, author of Below the Radar: How Silence Can Save Civil Rights, reviews the contributions of the Obama administration in the struggle for LGBTQ rights. Professor Gash argues that while Obama's use of low visibility advocacy paved the way for critical LGBTQ gains during his two terms, they may also inspire an equally quiet (and seismic) shift backwards. Bring your lunch and join us for an informal conversation on Supporting Muslim Students in the Classroom. No RSVP is required. To set the stage for our conversation, you’re encouraged to read "Do Muslim Women Really Need Saving?" Bring your lunch and join us for an informal conversation on Supporting First-Generation College Students. No RSVP is required. Inclusive Classroom Strategies that Support and Empower First-Generation Students. Bring your lunch and join us for a presentation and discussion on teaching DPD Courses online. Facilitators: Amber Moody and Kristen Andersen. No RSVP is required. This presentation explicates Harriet McBryde Johnson’s now canonical 2003 New York Times Magazine article, “Unspeakable Conversations: The Case for My Life” as a bioethical case study by applying narrative ethics, literary criticism, and rhetorical analysis. As a bioethical case study, Johnson’s narrative of the “case for my life” makes a strong claim for conserving disability, for what might be called—to follow Deaf studies—disability gain. Throughout this talk, Garland-Thomson develops a framework for understanding and advancing disability bioethics. 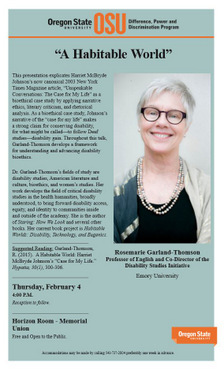 Dr. Garland-Thomson’s fields of study are disability studies, American literature and culture, bioethics, and women’s studies. Her work develops the field of critical disability studies in the health humanities, broadly understood, to bring forward disability access, equity, and identity to communities inside and outside of the academy. She is the author of Staring: How We Look and several other books. Her current book project is Habitable Worlds: Disability, Technology, and Eugenics. Bring your lunch and join us for the final informal monthly conversation of the term focused on teaching DPD courses and content. This session was held in collaboration with the AAC&U Centennial Dialogue on Inclusive Excellence. 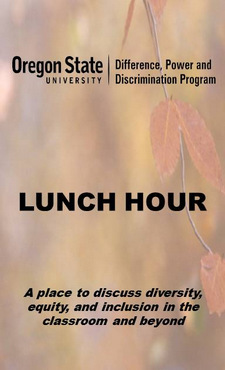 DPD Lunch: The Trigger Warning Debate: What is at Stake? Bring your lunch and join us for the first of three informal monthly conversations focused on teaching DPD courses and content. When professors attempt to teach content that focuses on race, gender, sexuality and other themes that can be politically fraught, they often meet great resistance in the classroom. 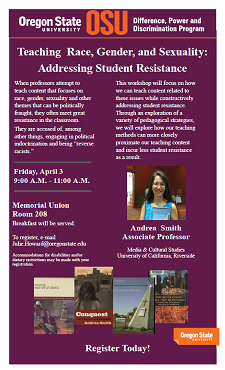 They are accused of, among other things, engaging in political indoctrination and being “reverse racists.” This workshop will focus on how we can teach content related to these issues while constructively addressing student resistance. Through an exploration of a variety of pedagogical strategies, we will explore how our teaching methods can more closely proximate our teaching content and incur less student resistance as a result. 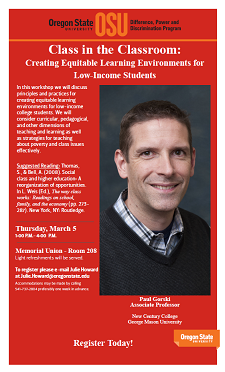 In this workshop we will discuss principles and practices for creating equitable learning environments for low-income college students. We will consider curricular, pedagogical, and other dimensions of teaching and learning as well as strategies for teaching about poverty and class issues effectively. 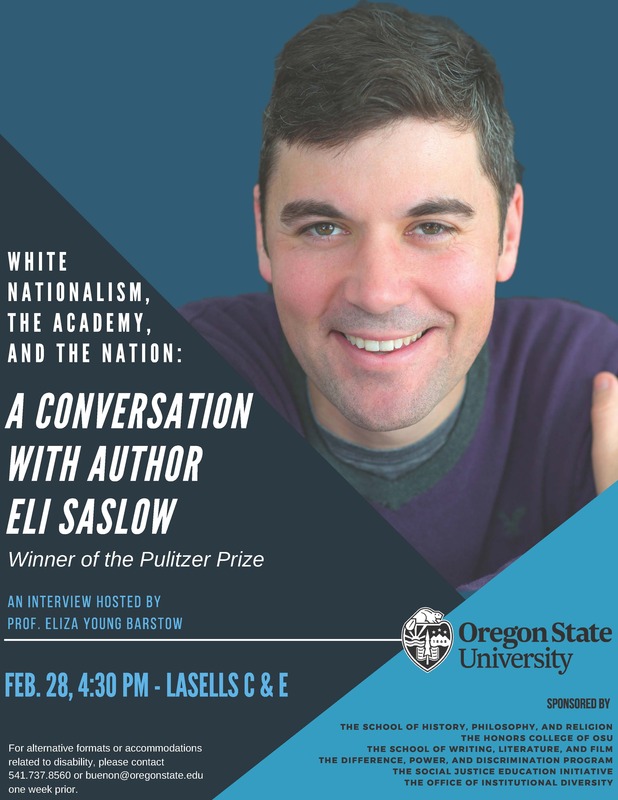 This presentation addresses the establishment and the expressed mission and mandates of public universities in the United States through the granting of federal lands in order to more deeply consider their (missed) democratic potentials. We will explore how classrooms in public universities can be spaces to interrogate the productive forces of normative histories and also dehumanizing rhetorics and, together, consider how to insert such narratives into our critical inquiries, curricula, and classroom discussions. 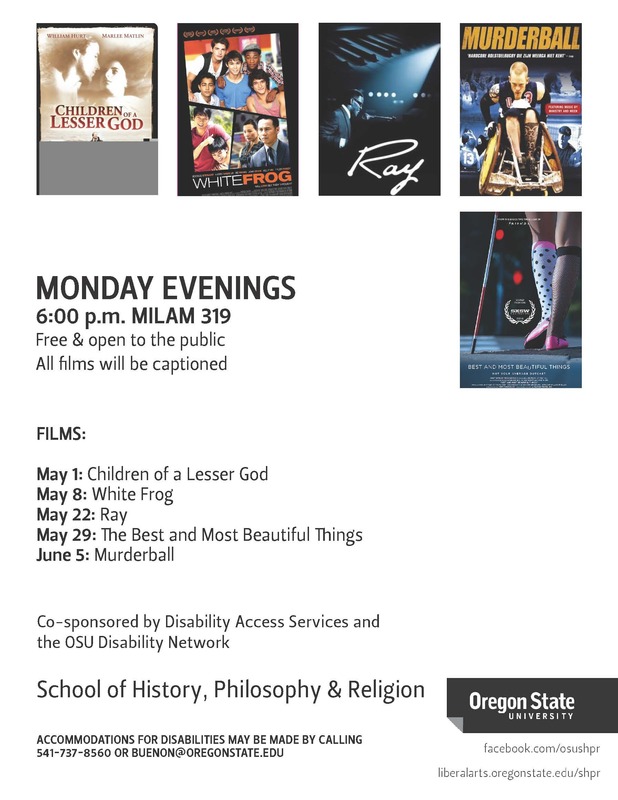 In an attempt to animate the practice of “critical localism,” the presentation will draw from works relevant to Oregon’s environmental and human history, that integrate science and the humanities to consider how such works might invite multiple knowledges into a number of classes from those in environmental and social sciences to those teaching rhetoric, poetry, and writing.